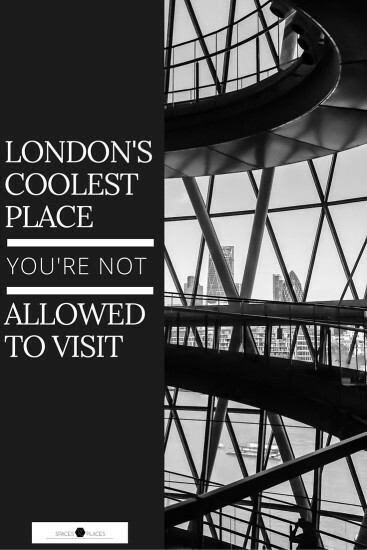 WHAT IS ONE COOL PLACE YOU HAVE VISITED WHERE THE PUBLIC IS NOT USUALLY ALLOWED? There are many actually! I love these kind of places and I’m always on the hunt to find them but my absolute favourite (until further notice) is London City Hall. It is an absolute stunning building designed by the architect Norman Foster, one of Britain’s leading architects. Located on the South Bank of the Thames close to Tower Bridge and it’s part of the More London development. It’s impossible not to notice it while strolling from London Bridge to Tower Bridge because of its unusual shape which has been carefully developed to lower the amount of energy that the building requires. The all interior revolves around an amazing helical staircase that runs for 500 metres from the bottom to the top floor. Of course the public is not allowed since the building is used as the home of the Greater London Authority. I was able to visit it from the inside last September during the Open House weekend in London and to be honest I hope to do it again even this year. That weekend has been amazing, it was like a treasure hunt, running from a cool place to the next one so don’t miss it if you’ll be in London the 17-18 of September 2016. Ps. All the picture have been taken with an iPhone, last summer I didn’t have any camera and my passion for photography was “under construction” let’s say. Hope you still like them, there will be better ones if I’ll go this year. Someone recently asked me this question and I thought it would have been a nice idea to reply with a post in which I can actually show the place and say something I’ve learned about it. And why not it can become something that I can do regularly. I would love to do it and be helpful. Thank you Marie! Zaha Hadid is one of my favourite too.I really hope the City Hall will be open to the public even this year and I’ll go again for sure!